In simple words, inventory is the term used to describe the materials or goods held by a business. It is divided in three categories: raw material (RM), work in progress (WIP) and finished goods. Raw materials are the goods used in production, WIP are the items that are being produced and finished goods are the items that are finished and ready to be sold. To get a true picture of a business’s financial position, it is important for it to be able to correctly calculate the value of the inventory it holds. There are several methods of inventory calculation. The selection of the way of inventory valuation by a business can directly impact its financial statements including cash flow statements, income statement, and balance sheet. It is important for businesses to track the number and value of items sold correctly so that they can correctly reach the value of the items they have in stock. The right method to calculate inventory’s value depends on several things, including the kind of goods (perishable or nonperishable), nature of business and industry practices. Highlighted below are some of the main methods of inventory valuation. 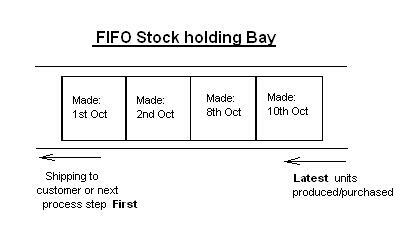 LIFO is one of the oldest methods of calculating inventory. This method assumes that the goods put last on the shelf are the first to move out. This system is applicable in goods that are not perishable. In this method, the higher priced items are the first to be sold with lower priced items remaining in inventory. By using this method, companies can increase their COSG and lower their tax liability. However, this method has a drawback as it does not take into consideration the replacement cost of items. Additionally, it does not keep up a correspondence with the actual flow of goods. First-in, first-out, as the name suggests is a method of inventory valuation that assumes that the goods that are put first on the shelf are the first ones to move out. In this method, the oldest goods are the first ones to be sold. This method is generally used by businesses that sell perishable goods, as they cannot afford to keep them due to their perishable nature. This method gives a lower COGS when the prices are rising, which makes the bottom line look impressive; however, the tax liability is increased as lower COGS means higher net profit. A big advantage of using this method is the fact that it represents all the purchases so that accurate replacement costs can be calculated. In this method, the cost of all the available goods is divided by the number of units to get one value at which all the goods are valued. The value is basically an average that helps valuate all the goods at one standard price. The disadvantage of using this method is that it fails to bring price changes into proper consideration and makes all the goods stand at the same price, due to which the profit may be understated or overstated. This is why it is generally used in businesses where prices do not fluctuate much.